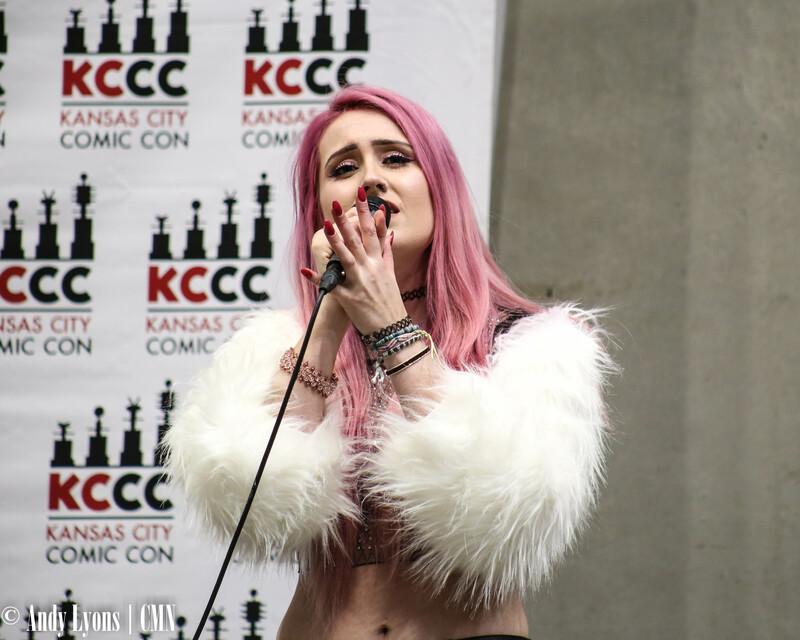 Anything can happen at Kansas City Comic Con, proved this year with Kevin Smith popping in on a panel and entertainment provided by KCXW Wrestling, a break from stereotypical Comic Con events. Kansas City pop artist Crystal Clayton fit right in, performing on the Live Stage Saturday night at KCCC. The performance was a first for her, but she was no stranger to KCCC having been prior as a spectator. Her outfit and performance fit the venue, her pink hair and feathered jacket blended well in the sea of cosplayers at Bartle Hall. Clayton has been making a name for herself in the KC metro, performing at venues such as Riot Room and recordBar as well as taking to the streets and playing in Artist Alley near Grinders during a recent First Friday event. Clayton released a new EP last month titled “Too Human” and played it in its entirety for the crowd at KCCC. Speaking to Clayton before her performance, she told CMN what goes into creating her music. “Too Human,” she worked with Denver-based producer Spencer Hoad. The two would send snippets of ideas back and forth and then Clayton said she would drive to Denver to record with Hoad, which she said worked well. Clayton said becoming a pop singer has been a lifelong goal. Her other influences include pop legends Mariah Carey and Beyonce Knowles as well as powerhouse vocalists such as Lady Gaga and Rihanna, and she loves to listen to more artsy performers such as Billie Eilish and Sabrina Claudio. Her love of across different genres really helped her find her voice. Clayton has performed at venues across the Kansas City metro including Riot Room and recordBar, as well as an impromptu performance in Artist Alley near Grinders during a recent First Friday. Clayton is performing live with fellow Kansas City pop group Olivia Fox at Knuckleheads on Dec. 7 and has Christmas shows planned throughout the holiday season. For more, follow Crystal Clayton on Facebook here. Listen to her EP, “Too Human,” via Spotify below.